Who doesn’t love pizza? 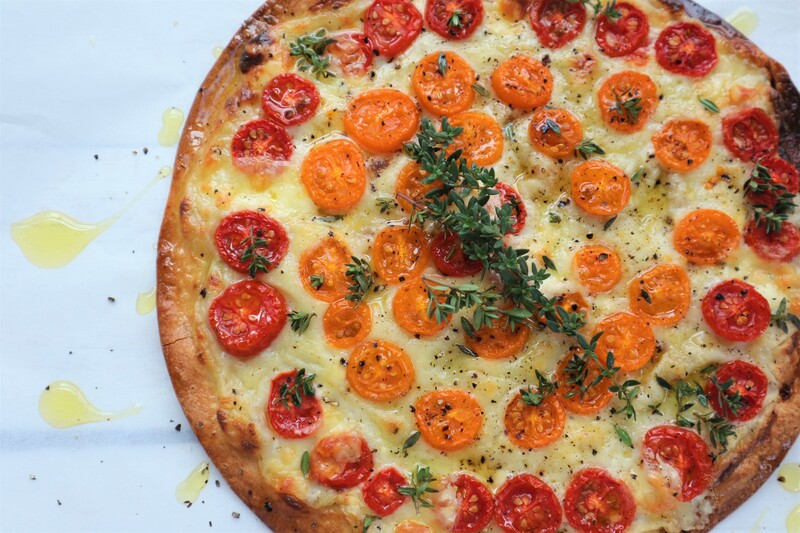 And the combination of a creamy white sauce base, sharp blue cheese and sweet tomatoes make this pizza a crowd favourite. We like to use a flat bread for this recipe as we love the thin, crispy base with the white cheese sauce however any good quality pizza base (homemade or store brought) will also work well. Pre heat oven to 350F (180C). To make blue cheese sauce add butter and flour to a small saucepan over a medium heat, stirring to combine. Once the butter is fully melted add milk and turn heat to high whisking fast until a thick white sauce forms. Remove from heat and crumble in blue cheese. Gently stir through and season with cracked pepper. Place flat bread on a sheet of baking paper and spoon blue cheese sauce on top, smoothing out evenly to about 1 inch from edge. Top pizza with sliced tomatoes in a circular pattern. Scatter sliced bocconcini cheese on top. Bake in oven for about 15-18 minutes until cheese sauce is bubbling and golden. Remove from oven, scatter with fresh thyme leaves and drizzle with olive oil. Serve and enjoy! Love pizza? Try our Free Range Egg, Spinach and Truffle Oil pizza recipe here or our Pizza Bianca with Smoked Salmon and Creme Fraiche here.